Do you know what's WAGASHI? Wagashi is the traditional Japanese sweets, a lot of wagashi discribe seasons beautifully. 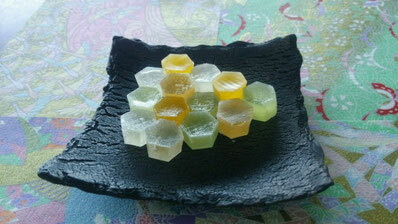 I bought ``kohakuto`` at minochu (one of wagashi shop) it' called Rikka. (・∀・) I recommend this sweets who doesn't like anko (red sweet beans) Transparent agar expless water, stream of rivers so people can feel cool atmosphere that's why it is summer wagashi. Kohaku means amber and to means sugar.